People really like to take home souvenirs of themselves. Photo booth pictures are the ultimate party favor. People put them on their refrigerator or on their office wall and literally keep them there for many years – creating a lasting connection to the memories of a fantastic day. Regardless of whether you rent a photo booth in Vancouver for a party or rent one in or anywhere else in Canada, in many ways, a photo booth actually does what only the most talented photographers can do – only it’s cheaper. Click here to learn more. When you rent a party photo booth from Forever Captured, you quickly discover that we pack a whole lot into our all-inclusive package. To start with, you get unlimited photos, and you can choose if you’d like these to print as either two 2×6 inch photo strips or as one 4×6 inch print. You can also select a backdrop – even a green screen – and we always provide a ton of really fun and interesting props to bring out your guests’ fun side. One of the things we’re famous for is our amazing photo strip designs. For us, every part of the party needs to be themed – including the photo booth. 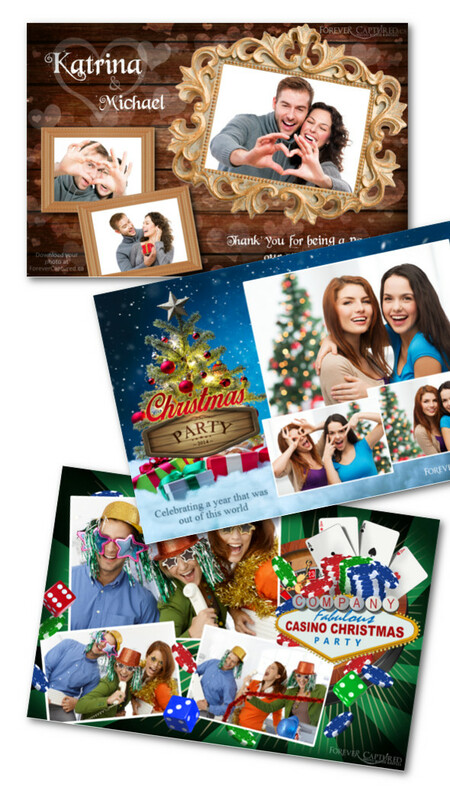 That’s why we often custom design photo strips and postcard style (4×6 inch) prints for parties for no additional cost. We theme these in consultation with the party organizer to incorporate the look and feel of the wedding’s colours and theme elements. We even make sure the touch screen on our photo booth that your guests will interact with is themed to match the photo strip. The end result is an amazing, completely customized photo strip or postcard style print that captures part of the magic of your special day and allows your guests to take it home with them as the ultimate party favor. Our photo booth is a modern, high tech, open concept booth. It prints out lab quality photo strips and postcard style prints in less than 10 seconds that are smudge proof and should literally last a hundred years – just like regular, quality photograph prints. We rent our booth for parties across BC’s Lower Mainland and the Fraser Valley. We take care of everything for you: delivering it, setting it up, running it, and taking it away. You don’t have to do anything but smile for your pictures and have a great time. You can literally start having some fun right now by choosing a photo strip or postcard style layout and then choosing your party design. You can also use these designs to gather ideas and then we can custom make a photo strip for you too.